Did you know that October is National Pork Month? I didn’t, even though I enjoy lots of pork dishes. And no, I’m not talking about just bacon. To celebrate National Pork Month, aka “Porktober”, Costco is offering some amazing discounts on top pork cuts. This week, from October 6 through October 12, you can save $2.50 off on boneless pork chops and roasts. Next week you can save $2 on Boneless Sirloin Tip Roast, and the week of October 20th, you can save $2.50 on whole boneless loins. I love shopping at Costco. There are so many great deals you can get on everything from clothes to food. (Like getting a Dyson heater for just $250 instead of $400 – score!) During our recent trip to Costco, I took advantage of their special pork-pricing and picked up a package of boneless pork chops. Pork chops can be used for a lot of different dishes and cooking styles, so I decided to prepare a couple of comforting pork dishes – Peach Glazed Pork Chops and Italian Breaded Pork Chops. 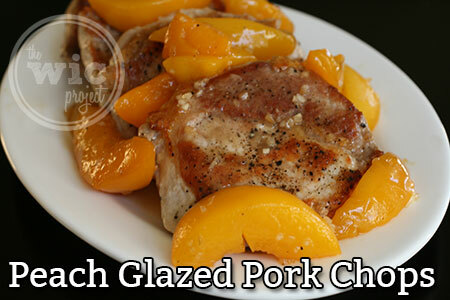 The Peach Glazed Pork Chops are one of my favorite pork dishes, stemming from my Dream Dinners days. 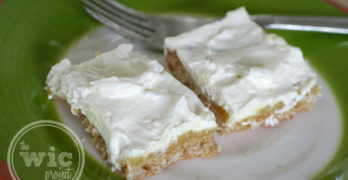 They have a warm and savory flavor with a hint of sweetness from the brown sugar and peaches. Serve it with some mashed potatoes or rice pilaf and a side of greens and you have a winning dish that is great for both kids and adults. You can even prepare the sauce in advance and freeze it for a quick meal options later. 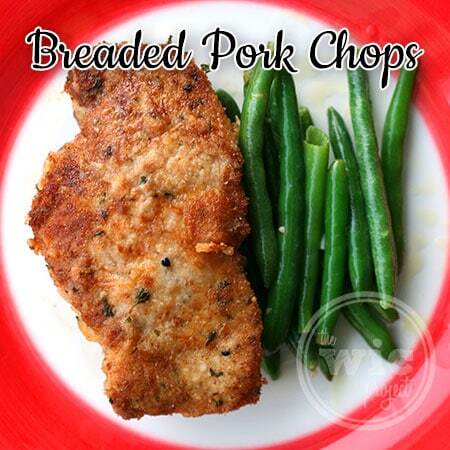 In this post, we’re going to share our recipe for Breaded Pork Chops. 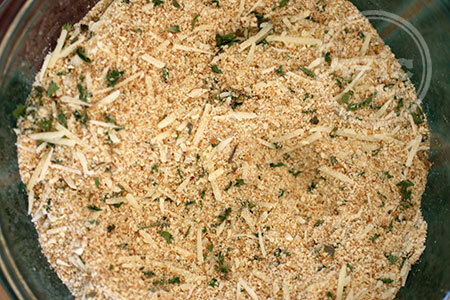 In another bowl (also large enough for the pork chops), mix the bread crumbs, Parmesan cheese, and dried parsley. Heat oil over medium heat in a large, oven-safe skillet. Add garlic and cook until lightly browned, then remove. Put one chop in the egg mixture, coating both sides. Then put the chop into the bread crumb mix, coating evenly around all sides of the pork chop. Repeat for each pork chop. Put the skillet, with the pork chops, into the preheated oven and cook for 20-25 minutes, until internal temp is 145F. Serve with mashed potatoes and green beans (or your favorite sides) and enjoy! This recipe has a few steps, but it’s actually pretty easy. It’s a “basic” breading recipe that really allows the meat to shine. The egg and milk mixture helps the breading stick to your meat. The bread crumb mixture is where you can get fancy. You can add more cheese, less cheese, add spices, or keep it simple. Once your pork is breaded, we’re going to give it a crispy surface in the frying pan first and then finish it off in the oven. I served my breaded pork chops with green beans, but you can serve it with pretty much any side that you want. Feeling hungry? Don’t forget to swing by your local Costco this month to get amazing savings on top cuts of pork. One winner will receive a prize pack which includes $155 in Costco Cash ($55 included to cover a new or renewed Costco membership), 7-quart programmable slow cooker, digital meat thermometer, and a silicon oven glove – a prize pack worth $250! Bacon-wrapped pork roast recipe. Wrapping the pork roast in bacon brings extra juiciness and flavor to the roast. Like to make breaded pork chops, or I like to grill the pork chops on my George Forman grill. i like pork fried rice!! My favorite pork dish is Barbecued Boneless Country Ribs. I like fried pork chops. I love pulled pork bbq – carolina style! Thanks for the chance to win! I like grilled pork chops. i like pork loin cooked in the slow cooker. I love Country Style Ribs. The night before I make them, I rub the ribs with garlic powder, salt and pepper and Montreal seasoning. I then slather on bbq sauce (my favorite is “Sweet Baby Ray’s”). Then I wrap the ribs tightly in aluminum foil and put them in the refrigerator. The next day I put the aluminum foil packet in the oven on a sheet pan with the oven on 325. I cook them for 3 to 4 hours. I usually cook 3 to 4 pounds of ribs. The meat falls off the bone. Sometimes after I open the packet I pour on some more sauce and put it under the broiler for 5 to 10 minutes to get those nice crispy bits! Pork adobo is a family favorite! I love pork chops right off the grill with pico de gallo!!! Trying sirloin pork roast in the crockpot right now! I love breaded stuffed pork chops. Pork chops with mushroom soup. My favorite pork disk is egg burritos with ground sausage. For dinner it would be marinated pork loin. Thanks for the giveaway…we love Stuffed Pork Chops ! Pulled pork sandwiches are always a favorite in my house! I like pulled pork sandwiches. We like our pork chops baked in mushroom gravy. ummmm gooood. Pulled pork is my fav! Yummy! Pork tenderloin, smashed taters, and green beans. I love sweet and sour pork! We love pork tenderloin with mashed potato’s. BBQ ribs are also a favorite. I like barbecued or grilled pork chops. I love to make stuffed pork with apple bacon! I love oven-fried pork chops. We love simple pork chops, sauted in apples and onions and butter. I love pork with pineapple! My favorite is Pork Tenderloin. balsamic pork chops are the best. Our favorite is spicy pulled pork. Vietnamese grilled pork, so good!!! BBQ Pulled Pork on sweet Hawaiian Buns! Pork Chops with Panko Break Crumbs are my favorite. Tastes good. pork bbq ribs for sure! I cannot eat pork for religious reasons. Hope I can still enter. A good pork tenderloin on the grill can’t be topped. I liked pulled pork sandwiches. I love grilled pork chops and shredded pork BBQ. Call me a traditionalist, but I love pork chops. I love stuffed pork chops or I usually make them thin, bread them and fry them like cutlets. My favorite is the way you make it, yummy! Pork Chops on the Grill marinated in a yummy garlic sauce! My favorite pork dish is Barbecued Boneless Ribs. I love a good pork loin roast! We love smothered pork chops. Pork Chops are my favorite pork dish. My favorite and families favorite is Pork Chops Marsala. I like to take pork chops (any kind) and put them in the slow cooker with spicy Thai peanut sauce. Cook on low for 6 to 7 hours, then shred it, put it back in the sauce, and serve on warmed tortillas with broccoli slaw for an easy weeknight wrap. I make a pretty good pork stir fry! I just shake n bake pork chop and they r goood! My favorite pork dish is pork chops with cheesy rice a roni. I don’t actually eat pork so I can’t post about my favorite pork dish! I like stuffed pork chops. Slow cooked baby back ribs! My favorite pork dish is baked ham. 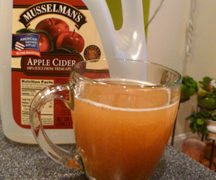 Pork with apples, cinnamon, nutmeg, brown sugar in crockpot. Mmmm. Grilled pork chops glazed with Costco’s Habernaro(sp) Chile and Pineapple sauce. My current favourite pork dish is Cooking Light’s Cider and Sage Pork. Yummy. Thanks for the giveaway. My favorite pork dish is pulled pork sandwiches! I like to make fried pork chops with potatoes and pork gravy. I like pork and sauerkraut. I like stuffed pork roast. I’m a vegetarian, but I had bibimbap (Korean mixed rice) with fake pork (seitan) at a vegan restaurant two weeks ago. It was excellent. Pork Carnitas – I don’t know how to make them but I know which restaurant to go to for the best! I love a good breaded fried pork chop! Pork tenderloin is my fave! I like to make stuffed pork with cranberry sauce. I have this recipe called Hot Dog Noodle bake that I love to make. It’s in one of the “Fix It and Forget It crockpot cookbooks. I also like making Carolina style pulled pork with red slaw. My favorite is Schnitzel. 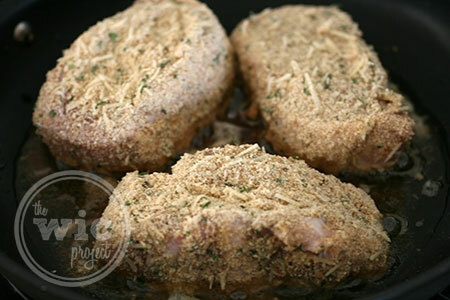 Pork chops dipped in egg, rolled in Italian bread crumbs and baked till golden brown. Pork chops, cream of mushroom soup, and a can of green chilies that has been cooking in the crockpot all day. My favorite is just plain Country Fried Pork Chops. I make a mean NC BBQ with pork! Bacon wrapped, sausage topped with pulled BBQ pork, cole slaw on sesame roll. Our current favorite is kalua pork! In summer, it’s gotta be BLTs with fresh tomatoes from our garden. Pulled Pork with Hot Country Sweet. Pork tenderloin is my fav. Pulled pork sandwiches are the greatest. I enjoy Honey mustard pork chops. Our favorite pork meal is either marinated pork tenderloin cut into bite size pieces served with rice or if we are in a hurry Sweet Baby Rays BBQ crock pot pulled pork sandwiches! I like a southwest rub mix with lime juice on my pork. I love breaded then fried pork chops like my mom use to make. I like to make marinated grilled pork chops. I love pork chops, mashed potatoes with country gravy and greenbeans!! I love to make pork barbecue in the slow cooker! My favorite is sweet and sour pork, served over rice. Thanks. I love pork chops in the slow cooker – pork chops in slow cooker with a can of cream of mushroom soup over them. Cook on low 8 hours. I serve over rice with a side of green beans. I’m a fan of pulled pork sandwiches with coleslaw. Thanks for the chance. My daughter and i love pork chops! I like breaded pork chops. My favorite pork dish is grilled, boneless pork chops, barbequed with sweet vidalia mustard sauce.